RDY_start An output which indicates that the start method can (safely) be called. EN_start An input which triggers the start method. RDY_result An output which indicates that the result value is valid. 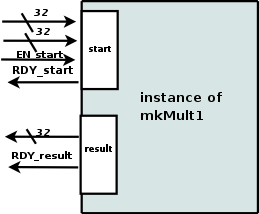 The complete Multiplier example Verilog file for mkMult1 is generated using the above compiler commands. Below is the section of the Verilog file showing how the interface methods are generated.